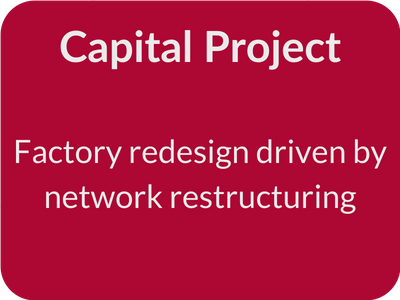 A client was planning on restructuring their supply network by moving additional product into a factory. The factory needed to be upgraded to cope with the additional volume. With the insights from these activities we were able to design a project and prepare a capital submission for the board. Bullant were then asked to provide professional project management support resources to create work packages for the project implementation. The network restructuring activity was on a very tight timetable and Bullant was able to come up with a viable plan quickly without compromising on due diligence.